I feel like I’ve been trudging through mud all week. That’s a phrase my mom uses fairly often when she’s having a hard time getting stuff done. For some reason, I’ve always imagined that the mud is actually chocolate pudding, which offers a more delicious visual. So I’ve been trudging through chocolate pudding all week. Obstacles here, there, everywhere! I can’t tell you how many trips to the grocery store I’ve made over the past few days. You know how it goes. The first grocery store is out of Brussels sprouts, the second doesn’t carry spring roll wrappers and the third store’s freezer section doesn’t offer any frozen spinach. Then you finally get home and realize that you forgot to put Parmesan on the list. Good grief. That’s not just me, right? I’ve decided that my version of paradise includes a grocery store that carries everything I need. No, I take that back—my version of paradise includes a self-stocking kitchen. Why doesn’t that exist yet? It’s 2015! 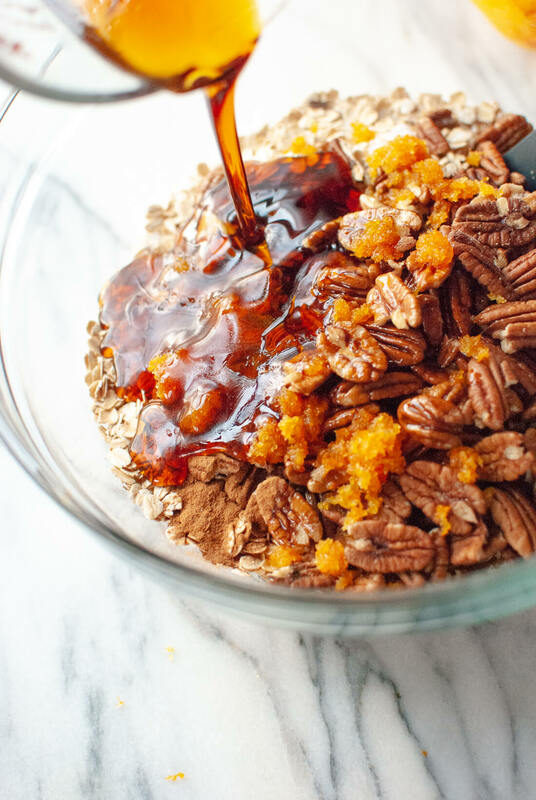 I found myself day-dreaming about self-stocking kitchens while this granola filled my house with the heavenly scent of fresh orange and warm maple syrup. I’ve been on a granola kick again and this kind is my new favorite. It’s extra clumpy and extra delicious. I always strive to use only natural sweeteners in my baked goods, but this one required a minor adjustment. I know from past experience that rubbing zest into sugar brings out the flavor of the citrus tenfold, so I rubbed the zest into a couple of tablespoons of sugar. That did just the trick! I’ve also learned how to make extra clumpy granola. The key is to crowd the granola a bit after you toss it halfway through cooking. Use a spatula to squish it down into a thick, even layer. Then let the granola cool completely before breaking it apart. This batch actually had all night to cool and harden before I took these photos. This granola is an irresistible snack, of course. It’s also fantastic with plain or vanilla yogurt for breakfast. You could add some fresh fruit if you’d like—clementine segments would be quick and delicious, and you can never go wrong with slices of ripe banana! 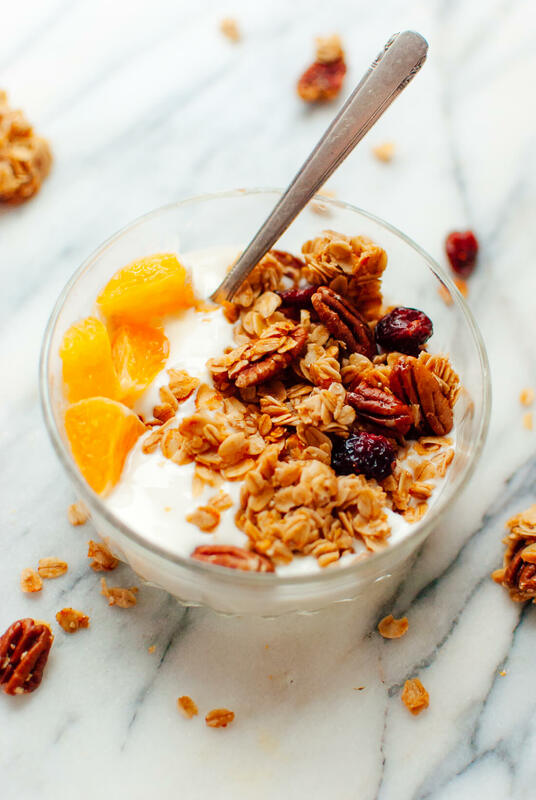 Simple and healthy, maple-sweetened granola with orange zest and dried cranberries. This granola just happens to be gluten free and vegan, too! This recipe yields about six cups of granola. In a small bowl, combine the orange zest and sugar. Use your fingers to rub the zest into the sugar until it’s bright orange and fragrant. 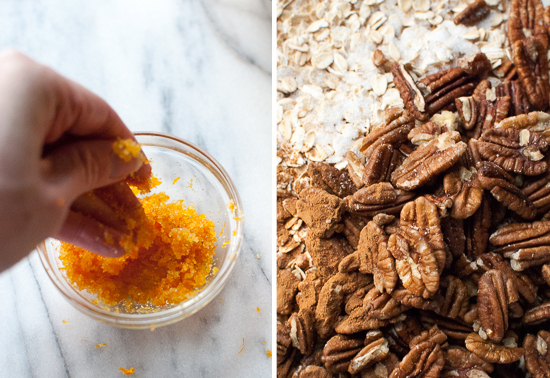 This step will ensure that your granola is infused with orange flavor. In a large mixing bowl, combine the oats, pecans, salt, cinnamon and orange sugar. Stir to combine. Pour in the coconut oil and maple syrup. Mix well. 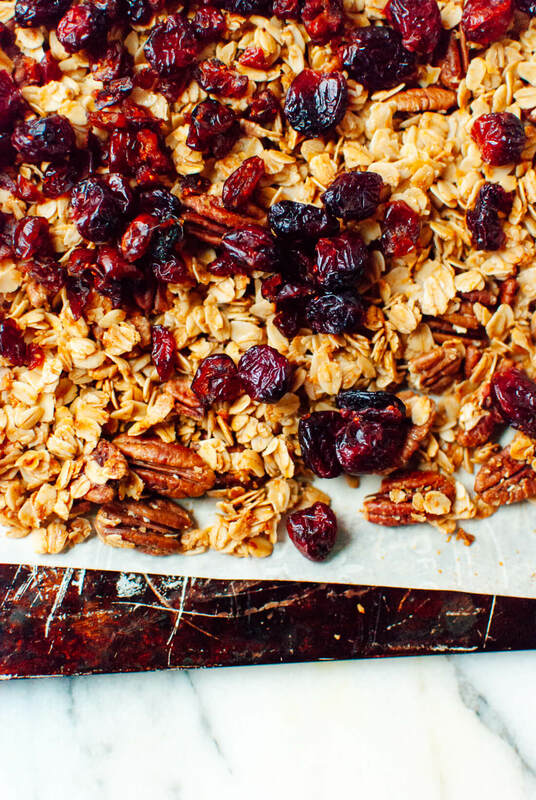 Pour the granola onto your prepared baking sheet. Spread the granola into an even layer. Bake for 24 to 28 minutes (if you used honey instead of maple syrup, check at 22 minutes), stirring halfway, until the granola is turning lightly golden in color. The granola will crisp up as it cools. Let the granola cool before stirring in the dried cranberries. Store the granola in an airtight container at room temperature for 1 to 2 weeks, or keep it in the freezer for longer shelf life. *Nut and seed substitutions: If you are using large, whole nuts (pecans, walnuts, etc.) follow instructions as directed. 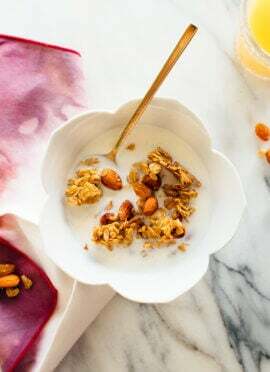 If you are using small nuts or seeds, like pepitas, or large coconut flakes, wait to stir them into the granola until you remove it from the oven halfway through cooking. Oh my goodness! This granola looks absolutely amazing, Kate. I love how you first rub the orange zest into the sugar, which releases all those wonderful flavors and aromas! Adding this to my must-make list. Thank you, Sini! Hope you love it. Have a wonderful weekend! Wow it’s like I sensed your post – this morning I was thinking, “I need to find a good granola recipe”…think I’ve found one! Looking forward to trying this! Perfect! Hope this one does the trick! It’s not you; Mercury is in retrograde! Definitely making this on Sunday for breakfasts next week. You know, I’ve never believed in astrology, but I’m starting to think there’s something to this Mercury in retrograde business. Life’s been funny lately! Hope you love the granola. I hear ya about the grocery stores. I’ve resigned myself to the fact that I have to go to 3 every week to find everything I need. Let me know when you find/invent the self-stocking kitchen so I can sign up! This granola looks delicious — especially as part of a cereal breakfast! 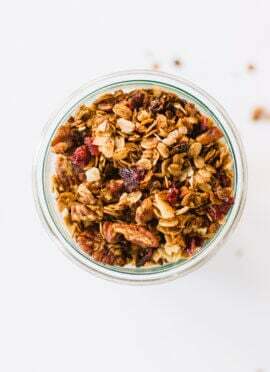 Fantastic granola – I love the combination of pecans, orange and cranberries. YUM. This granola sounds so good! Once I ate orange granola, but it was bought from a store and it was disgusting.. I may try to do my own with orange zest! Uh oh, I bet they used artificial flavorings. This granola is the real deal! I feel ya on the grocery store woes. It happens to me ALL THE TIME. Gah! I’ve seriously been to the grocery store about ten times this week. No more!!! Thank you, Lynne. I hope it turns out marvelously for you! I love the citrus in this granola, such a lovely flavour combo. Haha, that would be magical! Thanks, Cara. mmm, and how simple. i love orange/cran together. I’ve been making my own granola for a while (the grocery store stuff is so expensive/sugary) and this creating clumps tip is positively going to change my life. Really the only thing I miss about store bought granola! And the orange zest sugar!!! It really does bring out the essential oils like crazy. Although I tried to do it with coconut sugar once and it just turned into a paste! Sounds and looks delicious! I haven’t granola in ages. Well this certainly is one way to update breakfast – so yummy and the flavour combo is incredible! Sounds sooooo good! Can’t wait to try this one. You take the most beautiful pictures! Everything you make looks absolutely delicious. Food really is so beautiful! I love the shots of the orange zest! So much color and texture! And of course, I’m imagining the smell of orange and maple syrup emanating from the kitchen right now…can’t wait to make this! im on a granola train too right now, i made mine with honey, coconut and walnuts. I cant wait to try this esp with orange sugar.. i hope in 2016 we will have a self stocking kitchen, life will be complete after that…no? I love granola too! And this recipe seems like the perfect pick-me-up that my breakfast has been begging for. wow another great recipe. how do you come up with these great recipes? do you spend a lot of time mixing different flavors and seeing how they come out?? Thanks, Jean! I get ideas from all over the place. I often reference a book called “The Flavor Bible,” which is basically a thesaurus of flavors that work well together. I was thinking of making this tomorrow. Has anyone else had problems with using coconut sugar. I also have sucanet and was wondering how these sugars might effect the Orange infusion? Hey Rigel, I think sucanat would work fine but someone mentioned that they tried rubbing zest into coconut sugar once and it liquified! Yay, homemade granola! I love the idea of using the classic cranberry orange combination here. YUM. This looks crazy good! I am pinning it. I hate those kind of weeks! 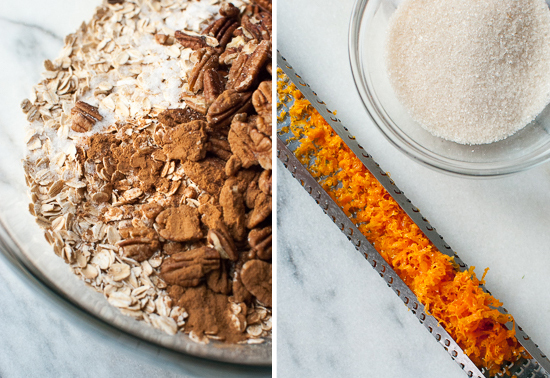 I can not get over the zest in this granola…genius. And I am the same about natural sweeteners in granola but I love that sugar/zest tip, what a great recipe! I need to get back into making granola regularly again. Love the combo of orange and cranberries and colors are just so bright. How can you adapt this recipe to make granola bars? Thanks! Wonderful granola. I left out the granulated sugar and only used 1/4 cup maple syrup and it is plenty sweet. Thanks for the great recipe. I made this granola last night in between Superbowl-food-making so I’d have healthy breakfasts for the week..taking a break from my green smoothies and avocado toast. It is AMAZING..maybe the best granola I’ve ever had. The orange zest sugar thing takes it to the next level..thanks SO MUCH for the amazing recipe! Thanks, Merrilee! Hope your granola turns out fantastically! did somebody say “chocolate pudding”? with chocolate on the mind, i imagined this as *chocolate orange* granola (the idea of which has consumed me). i’m picturing chunks of dark chocolate in place of cranberries. ahh. i like the sound of this technique of rubbing the zest into sugar — do you think coconut sugar might work, too? I have a serious homemade granola addiction, and I think this one needs to be next on my list of recipes to try! The combination of the orange and cranberries with the maple syrup-sweetened granola sounds incredible! 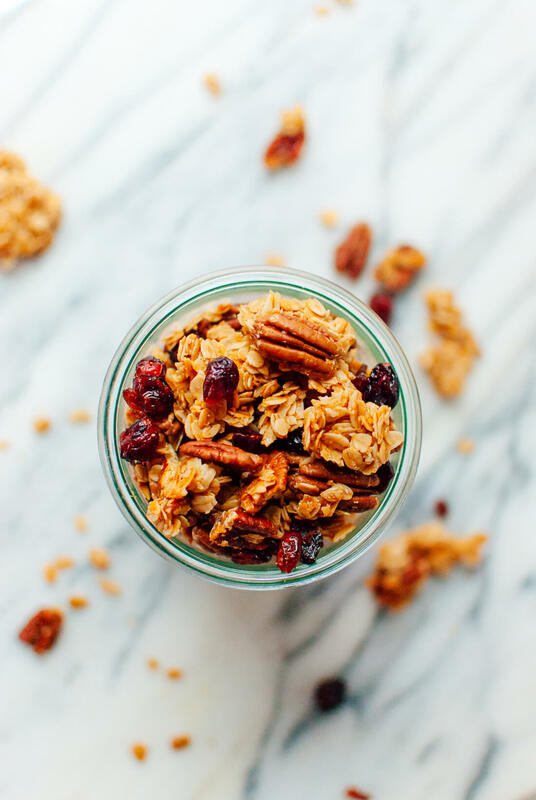 Oh my goodness this granola looks so delicious and I will be making us a batch of it asap!! Hi Kate! I made the granola and it turned out really well. It was a bit sweet for my taste, so next time I’ll use less sweetener, but the orange flavour was really good. Thanks for the recipe! Awesome! Your version sounds delicious. Thanks, Liv. Thanks, Ela! Glad you’re enjoying the granola. This looks really yummy! I wanted to ask you a question. I’m thiking about starting my own food blog. I see on all food blogs around beautiful pictures of their recipes and procedures. Do you take the pictures yourself? If so, what camera do you use? This is one of my concerns of starting the new blog. I don’t know, if it will workout. I love to cook and bake, but I am not a professional chef. I have a lot to learn. I am scared that it will not be good enough. but I might just give it a try. I’m sorry! I just read your bio. I got the answer. So I actually made this granola Friday night because I wanted it first thing Saturday before hot yoga. I used half oats and puffed cereal, almonds, walnuts, honey and whatever else was a staple ingredients. The orange zest gives it a bright flavor. I let it set out overnight but was disappointed at how little of it stayed together in a bar/clump vs. breaking up. I don’t do dairy so I eat it by the spoon. I’d love to know how to get the granola to stick together more firmly. Hi Laura, I’m sorry your granola didn’t stick together. I’m not sure if it had to do with your substitutions or the method. It is important to get the ratio right. Did you press down the granola with the back of a spoon/spatula after stirring it halfway through cooking? I think I have made 100 (no exaggeration) batches of this since March or maybe more since we found this recipe. It has become quite an addiction in our family! I even have the recipe memorized since we always make a double batch. And with a family of granola eating 5…we can’t get enough. It is just simply the best granola I have ever had. Love your blog! It tastes sooo so good by itself, I haven't even tried it with milk as cereal yet and I'm already in love. I love the flavour combination. This was outstanding. My house smelled heavenly.my new favourite snack! Just discovered this and made it, and wow! My morning breakfast was amazing. Shared it with everyone I know on Facebook. I used walnuts instead of pecans and cheated by adding 1 tsp orange extract to the maple syrup, as I didn’t have fresh oranges to zest. Still amazing! Delighted to hear it! Thank you for sharing with your friends, Jennifer! Best granola I’ve ever had. Really the perfect blend of flavors. The neighborhood kids come running when I make this! Thanks for the great recipe! I just made this granola again last night as I am totally addicted!! I do have a question for you: if I wanted to turn this into granola bars, what modifications would I make to the recipe? congratulations on your upcoming cookbook! Yay! So sorry for my delay! I’m happy to hear that you loved the granola and LOVE the idea of cranberry-orange granola bars. 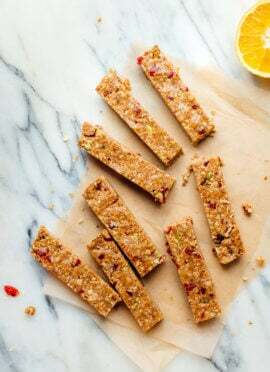 I would actually base the granola bars on this recipe, substituting toasted pecans for the almonds, adding orange zest and maybe using maple syrup instead of honey (up to you). Maybe I’ll make some cranberry-orange bars for the blog! I saw this linked on the holiday list and I had to chime in. I make lots and lots of granola, often trying a new recipe every week. This was, by far, one of the BEST granola recipes I have ever made. It was not only delicious and pretty, but it inspired me to think outside of my usual (granola) box! Thank you so much for this fantastic recipe. Saw this on the holiday list and absolutely had to make it. Just finished a bowlful with some coconut yoghurt while sitting in front of the fire and watching a Christmas film. Absolutely delicious, and can’t wait to have it again for breakfast with some orange segments. doubled the batch and stuck half in a Kilner jar that I’m going to give a friend for Christmas. I know she’ll love it just as much I do! I did add some orange juice from half of one of oranges, just to give it another kick along with the zest, and stirred in half a cup or so of cacao nibs before baking. Thank you, Bethan! I’m so glad you enjoyed the granola. Happy holidays! Total keeper recipe. Made it and added a squirt of orange juice. Replaced the white sugar with xylitol and it worked great for the zest. Used seeds instead of nuts (nut free school). Added a handful of dark chocolate chips and all of a sudden, my kids love granola. Thank you! This granola is amazing. Thanks for your detailed instructions (like pressing down hard with the back of the spoon)–I think those make all the difference! I’ve never had granola turn out right before. I used whole pecans and maple syrup. Only cooked for 24 minutes, stirred half way through, and some of it got burnt. I also made the mistake of putting the cranberries in with the granola to bake. What a disaster! Should have read the recipe closely. I’ve made this several times, each time with my own little twist, like half pecans, half pistachios plus adding the juice of that orange but the zest with the sugar is the best, I’ll never change that. My husband turns his nose up at any other granola now. I just made this granola and I omitted cranberry which I don’t like. But it turns out really awesome with fresh orange aroma. It is a perfect match for my breakfast yogurt. Thanks a lot. Just made this for some yogurt-fruit-granola parfaits tomorrow a.m.
Suuuper tasty…but it didn’t clump at all :/ I followed the recipe verbatim…but no clusters whatsoever. I just made this (literally, I just sat down from putting it in containers), it was my first ever attempt at granula and it is delicious!! The recipe turned out just perfect. Thank you for this!! I make this recipe a LOT! Everyone in my family loves it, and it just doesn’t last long. This year, I’ve made some as Christmas gifts. Thanks for sharing your recipes! Just made this granola, and my kitchen smells amazing! I’m currently pregnant and have been loving all things citrus lately, so it was good timing that I came across this recipe. I did use coconut sugar, and it made more of paste and did not resemble the bright orange color in your picture, but I didn’t have any trouble getting it to blend into the oat mixture. Thanks for all the great, healthy recipes—my husband and I make something from your blog at least once a week! What perfect timing to crave citrus! Winter is a great time for a citrus treat. So glad you loved it, Jen. Thanks so much for sharing this fantastic recipe! I made this yesterday and am eating it now over vanilla bean Greek yogurt…and OMG it’s amazing! I’ll be making this again and again and can’t wait to try more of your recipes :) Thank you! Delighted to hear this, Heather! Let me know which other recipes you try. 1) I adore all the recipes I’ve tried on your blog—and I’ve just gotten my copy of your cookbook! I can’t wait to dig into those. 2) I loved this granola—but mine stuck to the pan quite badly, so I had to scrape it off. Is it because I didn’t use parchment paper? (I imagine that if I had, it would have just stuck to the paper, but maybe I’m wrong.) I also used all honey rather than maple syrup. Could that have been a factor? Hey, Louise. I’m so glad you love the book! And yes, that’s exactly what the parchment paper is for– this will stick to metal pans, but the parchment paper keeps it loose while it cooks. Thank so much for your reply! I’ve been enjoying this granola every morning since I made my first batch. I can’t wait to make it again with parchment paper! Thoughts on how this would work with minute-oats instead of old-fashioned rolled oats? I have a lot of minute-oats sitting in my pantry and would rather use up those if possible. I’m so glad you enjoy this version, Brenda! I hope your colleagues enjoy it, too. Sugar is a natural sweetener! I love this granola! I make it all the time. Instead of cranberries I use dried cherries for a little extra tartness. Sounds wonderful! Thank you for your review. Regardless, this will be a repeat for me! I’ve been enjoying it with coconut yogurt for breakfast and sneaking little granola snacks all day! Very delicious – best muesli/granola i have ever tasted! Fantastic, Bonnie! Thanks for your review. Store the granola in an airtight container at room temperature for 1 to 2 weeks, or keep it in the freezer for longer shelf life. Hope this helps! This granola is a lovely combo of flavors. I made it twice; once as directed and the second time with the following modifications (loosely following ingredient amts for a granola recipe I’ve made regularly for 20+ years): added about a half tsp of orange oil to the sugar to up the orange flavor; upped the amt of oats, using 5 cups of rolled oats and adding a cup of wheat germ to boost the nutrition value; chopped the pecans rather than leaving whole for better distribution; left out the salt as it was too noticeable and decreased the cinnamon to a1/4 tsp., again not to overpower the orange flavor. Also, preferred honey as a more delicate sweetener that doesn’t compete with the subtle orange flavor. Now my husband and I “negotiate” over which granola recipe we make–the old standby or this new one, which is my favorite! Thanks much for the recipe. Thanks for sharing how you make this, Judy! I love that you and your husband have a granola debate. That’s great! You’re welcome, Tracy! Thanks for the review. Best granola I’ve ever had! Great tip about enhancing the orange flavour by rubbing it in sugar. I’ll try that technique with other citrus subbing salt for sugar in savoury recipes. Hmmmm, this didn’t quite work as well as I’d hoped on first go. Holding off on rating because I think it’s partially my fault – I only had coarse sea salt, which might be too much – but I also don’t taste the orange very much. Should I increase the zest next time? I’m sorry it didn’t quite turnout for you. The salt would make a difference for sure. Did you make the orange sugar mix? Love it! I’ve made it three times! Love that, Kathy! Thanks for the review. wonderful treat and I will be making another batch for myself.